Discussion in 'Technical Help' started by gesp_shad, Jul 20, 2017. I am struggling with an odd issue with my game performance when it comes to GPU load. I was setting the global display refresh rate to 60Hz in the nVidia driver, because at 144Hz the game uses way too much GPU power. The fans spin at 100% and the card produces a lot of heat. Furthermore I was not able to set an idependent value for the refresh rate and Vsync for the game either in the driver, in the config file nor in the game itself. It was overwritten by the global settings every time. I am currently bulding a quite large town on a dedicated server which demands quite a bit performance now. At 60Hz I will get about 30fps in game with a CPU load of 25% and GPU load of 35%, using 7GB RAM and 4GB VRAM. At 144Hz I will get about 55-60fps with a GPU load of 70%. So my question is, why is the game not using the potential of the GPU to get more fps at 60Hz or even at 144Hz? Is this a problem in the driver (I am aware it is not the latest driver) or the game itself? And is there a way to set independent values to the global driver settings? Slightly better performance at 60Hz: 45-50fps @65% load. The same result for 144Hz, which is worse than before. 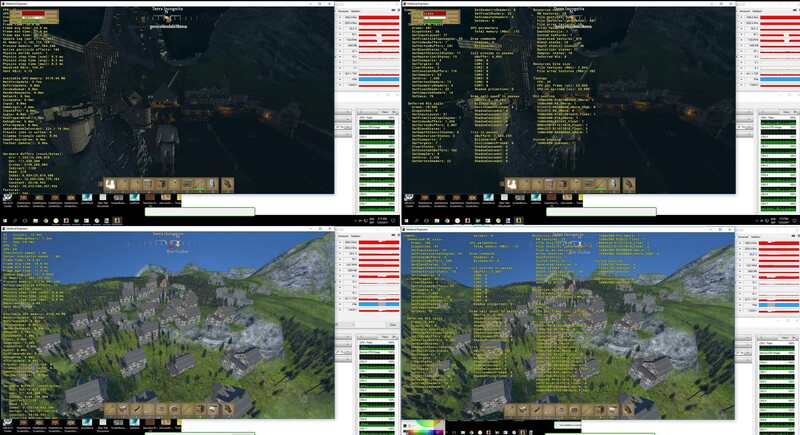 I did some very fast testings and the result is that I am also hitting about 30% load, no wonder I am only getting 30 fps...It seems to be related to very big cities, because in a normal world I get 80% load and max fps. What cpu do you use? Do you think mine is bottlenecking the performance somehow? Have you tried playing in a massive city and see what the load is? You can join the planetsNoLag server and go to the claims east side of Fareon. I just did another test and none of my cpu threads went over 50% so definitely not cpu bottlenecked. Is it a bug or a mod maybe? I dont know yet, since I am not the admin. It is either one of the latest mods (Armory, WarBanners, Extended Inventory) or someone was building a clang machine which got outta control. The admin said, the crashlog was the same as in this bug report. EDIT EDIT: @CptTwinkie It is running again on Tuesday's backup. So if you like you can join and I will show you the world/town I am having problems with. Today it is worse again, max 25 fps @35% GPU load. 2 CPU threads are used a little bit more. This seems to be a hardware issue. Have you tested a large world with this machine? I use gsync with my display, could this be the problem, since i got different results with different refresh rates? I use G-SYNC with my display, could this be the problem, since I got different results with different refresh rates? We haven't done any testing with G-SYNC. It's possible that it could be causing an issue. Have you tried disabling G-SYNC? Have you tried disabling G-SYNC? Yes, and all kind of settings within the nVidia Control Center. None of them had any effect to that issue. Wow, so much log spam. We're going to have to clean that up a some. I don't see anything that would affect it much unless there is a large cumulative affect from the mods. Have you noticed much difference toggling v-sync? No, I was not noticing a difference with V-Sync on or off. Maybe that's because the driver still overwrites it with G-Sync technology? Regarding the world, I have to ask the server admin @zeronio at first if he would provide it, since it is a DS. Currently we are running 13 mods. Do you need a list them or are they listed in the log file? Got the save file, sending it via email. Thank you so far! Keep in mind, that this save is a quite large (>200MB) dedicated server file, which takes some loading time (~10 min). It should be loaded either on a dedicated server, as well or on a very powerful machine. I also did some testing on this. I think I will do some tests with other games to see what the gpu load is there. I am pretty sure the gpu is bottlenecking on something. More testing will be required. I loaded it up and things were going well as I flew to your town and landed there. A few seconds after I did there was a momentary freeze on the render thread (The F11 debug numbers disappear and come back). After that my GPU was only working 17-24%. I'm not sure what would cause that thread to freeze like that. We haven't seen that kind of behavior in a long time. Hm. I am just relieved, that I am not the only one having this problem. I was testing if the CPU is bottlenecked by structural integrity, so I turned it off on a world that I know of, that behaves very bad. But there was no difference. One of the players on our server built a massive construction and it takes almost 20 seconds to load in when you come near to it and results in an average framrate of 10 FPS. GPU is still underloading badly and the "main" CPU thread peaks at around 80-85% usage (thread #11), like on the screenshot I posted earlier. Hyperthreading deactivated: No difference FPS wise, but CPU thread load seemed to be much more homogeneously like in your screenshot, @CptTwinkie rather than one almost maxed out thread like in my screenshot. V-Sync deactivated: 10-12 FPS less @35% GPU load. Toggling V-Sync in game won't apply immediately, though. You have to go back to the main menu. So I guess, that's another bug? Switching between resolutions is telling me, that there seems to be some kind of threshold in FPS, so the GPU will only render to a certain FPS level. I hope that is helping you at some point, when you have time to focus on this issue .